Recommendation: Recommended for those interested in Polish or French aviation history of WWII. 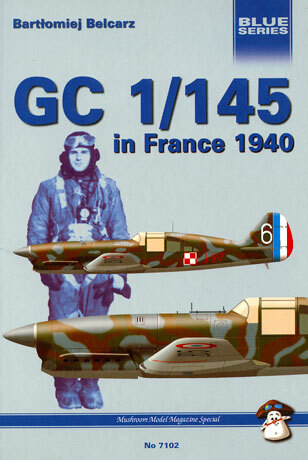 "GC 1/145 in France 1940" follows Mushroom Model Magazine's tradition of covering esoteric and interesting aviation history subjects. This is the story of Polish pilots who escaped their country after German conquest in 1939, to find themselves once again matched against Luftwaffe in France during 1940. The book comprises 96 pages in 9.5" x 6.5" format, with soft covers and including a 32 page colour section with walkaround pictures of a preserved Caudron C.714 in Finland and 12 colour profiles of C.714s and a further 2 of MS 406s. As the period covered is quite short - little more than a month in May and June 1940 - the day to day operations are covered in good detail. The historical text is supported by many black and white wartime photos of planes and pilots, plus tables describing operations, squadron strength, victories and so forth. Although it is essentially a snapshot history of this Polish unit during the Battle for France, the book will also be of value to modellers due to the rich assortment of photos (especially the Caudron C.417), walkaround photos and profiles.